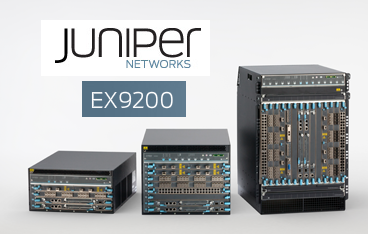 Juniper Networks introduced its EX9200 Programmable Switch for enterprise campus and data center deployments. The new EX9200 family, which will be available in three sizes (4,8 and 14-slot), leverages a custom-built "Juniper One" programmable ASIC to support the programmability demands of new Software-Defined Networking (SDN) protocols and application flows. Beyond the management automation in the Junos OS, Juniper is building native interfaces for OpenFlow and support for the service chaining in its SDN architecture. There will be integration with virtualization orchestration systems including VMware and OpenStack. Initially, Juniper is supplying 1/10/40GbE interfaces although 100GbE cards are expected later this year. At the high-end, a fully configured single EX9214 can support up to 320 10GbE ports. The EX9200 also features Virtual Chassis technology that enables a deployment to scale up in terms of ports and line cards in multiple chassis while being managed as a single switch. The EX9200 switch fabric delivers up to 240 Gbps (full duplex) per slot. Performance characteristics of the EX9200 include up to 13.2 Tbps of switching throughput, the ability to handle up to 1 million MAC and 256,000 IP addresses, and the ability to support 32,000 Virtual LANs. MPLS and VPLS support is also featured on the EX9200 Ethernet switch. Juniper also introduced a virtual JunosV Wireless LAN Controller, which can run on any combination of physical appliances, on a virtual machine (VM), or directly on future Juniper switches. The virtualization effectively makes he wireless controller functionality a service on the network. The virtual Wireless LAN controller supports clustering, in-service software upgrades, self-organizing adds, moves and changes, and local switching across the portfolio. Juniper's production introductions also include a Junos Space Network Director, which provides a single-pane-of-glass network management solution for wired and wireless LANs and data centers. The idea here is to consolidate various management tools into a single management view. Oracle announced its Virtual Networking open architecture for simplifying data centers using software-defined networking principles. 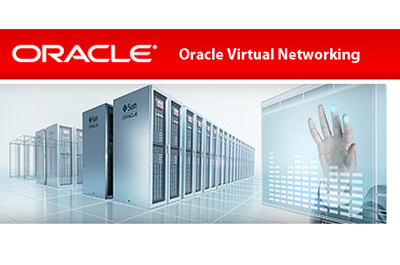 With Oracle Virtual Networking, the company is promising "the industry's fastest data center fabric with up to 80 Gbs bandwidth to the server and support for Oracle's SPARC T5, T4 and M5 servers along with the Oracle Solaris 11 on both SPARC and x86 platforms. More specifically, Oracle Virtual Networking is a data center fabric for controling larger server pools with scalable I/O. By using this architecture and its own SPARC T5 systems, Oracle can scale up to 1,000 servers and 128,000 cores of compute performance. The virtualization capabilities provide the ability to run more VMs per server and get predictable performance for applications with granular quality of service controls. For cloud deployments, Oracle said its solution can create up to 16,000 private Ethernet layer-2 networks inside a single fabric and maintain necessary network security in multi-tenant cloud environment. Additionally, the new release of Oracle Fabric Manager 4.1 unifies management for SPARC and x86 systems deployed with the Oracle Fabric Interconnect. Oracle Fabric Interconnect (formerly the Xsigo Fabric Director)-- a switch offering 20 Quad Small Form-factor Pluggable (QSFP) connectors for connection to servers, storage, or Sun Data Center InfiniBand Switch 36 systems. "As the industry's fastest data center fabric, Oracle Virtual Networking enables increased performance and agility while virtually eliminating the complexity in traditional data centers," said Raju Penumatcha, vice president, Product Development, Netra Systems and Networking, Oracle. "Now with added support for the fastest processors on the planet and the first cloud OS, customers can leverage the benefits of Oracle Virtual Networking in both SPARC and x86 environments." In July 2012, Oracle acquired Xsigo Systems, a start-up in San Jose, California that developed network virtualzation technology. Financial terms were not disclosed. 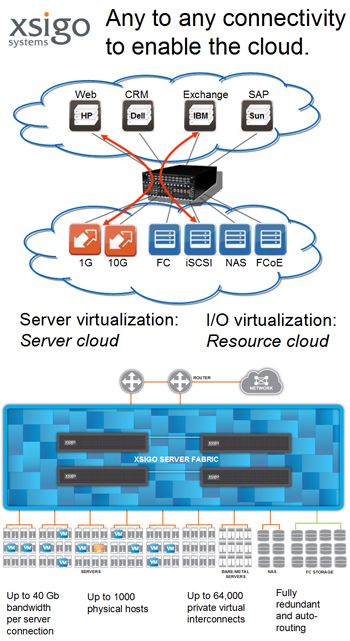 The Xsigo Server Fabric aims to do for infrastructure what VMware did for the servers -- namely, to enable one-click network connections from virtual machines to any data center resource – including servers, networks, storage, and other virtual machines. By providing this "one click" tool to connect VMs to networks and storage while using existing Ethernet routers + FC directors, Xsigo calculates that it can reduce the number of I/O cables and cards in a data center by up to 70%, thereby significantly cutting deployment CAPEX and simplifying operations. The Xsigo Server Fabric is a rack-based solution that works by virtualizing connections between networks, servers and storage, not by re-configuring switches, switch ports, or VLANs. It supports Ethernet and Fibre Channel connections at up to 40 Gbps. Environments can be scaled to 1,000 physical hosts with tens of thousands of virtual connections linking virtual machines to each other and to network and storage resources. Xsigo said its fabric is fully interoperable with existing core networking products from Cisco, Brocade, Juniper and others. 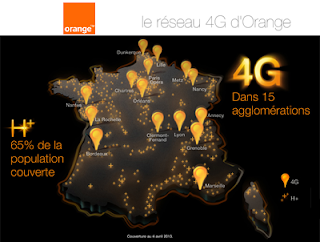 Orange has extended its 4G network to 15 new markets across France, including 50 towns, as well as the 1st, 2nd, 8th and 9th districts of Paris. LTE in additional cities will be launched in June 2013. T-Mobile USA added 579,000 in the quarter to 34 million. This compares to a net loss of 349,000 branded customers in the fourth quarter of 2012. "These results display positive momentum and the first positive branded growth in four years," said John Legere, President & CEO of T-Mobile USA. “We have made material progress in stabilizing our branded business in Q1, which provides a solid foundation to build on with the new Un-carrier customer offers we launched last week across America. Branded net customer additions were positive in the quarter, a significant improvement of 352,000 sequentially. Branded postpaid net customer losses improved to a loss of 199,000, a 61% improvement from a fourth quarter 2012 loss of 515,000. Branded postpaid churn declined to 1.9%, an improvement of 60 basis points sequentially and the best branded postpaid churn results in four years. Cyan filed an S-1 form with the U.S. Securities and Exchange Commission for a proposed initial public offering (IPO). Goldman, Sachs & Co. and J.P. Morgan Securities are joint book-running managers. Cyan is headquartered in Petaluma, California. F5 Networks warned that revenue for its second quarter of fiscal 2013, ended March 31, are expected to be $350.2 million, below the company’s guidance of $370 million to $380 million. GAAP EPS is expected in the range of $0.79 to $0.80 per diluted share, compared to guidance of $0.93 to $0.96 per diluted share. F5 said the revenue shortfall resulted primarily from a slowdown in North American and to a lesser extent EMEA sales, while sales in Japan and Asia-Pacific were essentially in line with the company’s expectations. Telco bookings were down sharply on both a sequential and year-over-year basis. U.S. Federal sales were also down significantly from the second quarter a year ago. "From a market perspective, Telco bookings were down sharply on both a sequential and year-over-year basis. U.S. Federal sales were also down significantly from the second quarter a year ago. Currently, we are looking into all the factors affecting the quarter’s results and we plan to provide more color during our regularly scheduled release and conference call on April 24,” said John McAdam, F5 president and chief executive officer. Zerto, a start-up based in Herzelia, Israel, closed a $13 million round of Series C financing for its hypervisor-based, disaster recovery and replication software for virtualized environments. The Zerto Virtual Replication (ZVR) 3.0 provides hypervisor-based replication and disaster recovery for all virtualized workloads at the VM-level. This extends a software defined data center vision to business continuity/disaster recovery solutions. The round was led by RTP Ventures, an affiliate of ru-Net Holdings, with strong support from existing investors Battery Ventures, Greylock IL and U.S. Venture Partners. Murat Bicer, managing director of RTP Ventures, will join the company’s board of directors. Founded in 2009, Zerto had raised $21.2 million in previous rounds.